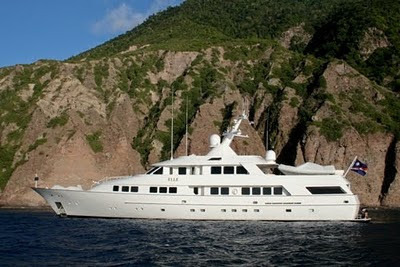 After a major refit in 2008, the 151' Tacoma Yacht, Elle in St. Maarten beginning December 15, 2010 and will remain there for the winter 2010/2011 season based out of St. Maarten. ELLE has 5 guest staterooms that accommodates 10 guests. Master California King Stateroom is on-deck with a port to starboard incredible master bath. There are 4 guest staterooms all with with king-sized beds. All staterooms has well appointed large marble showers and entertainment centers as well.